I have wanted to visit for a while. No, this isn’t a Michelin-starred restaurant. No, one isn’t dazzled by drifts of white linen tablecloths or the shine of silverware. It’s a café, or at least a café of the Japanese kind. Kanada-Ya is a ramen bar. There is quite a bit of choice if one wants to slurp noodles in London. 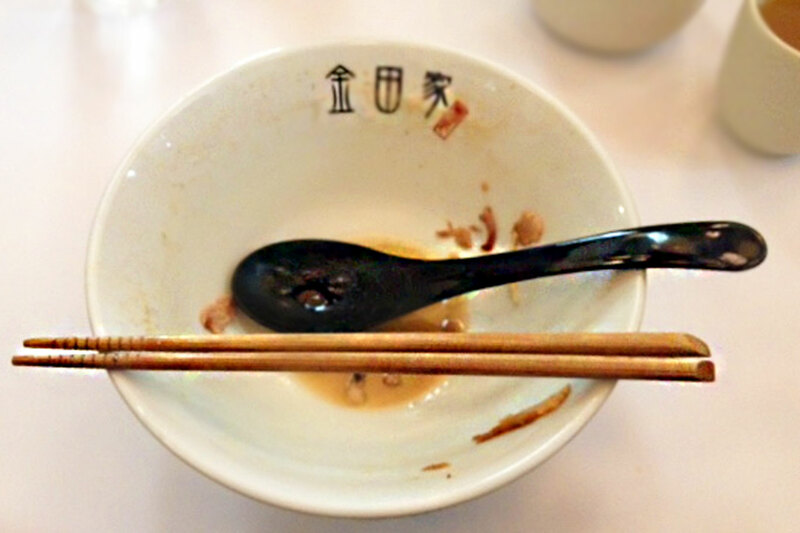 Udon noodles compete with ramen for the attention of transplanted Japanese as well as indigenous Londoners. This corner of the city is blessed by two ramen establishments but one in particular, Kanada-Ya, was intriguing me. Kanada-Ya opened in September 2014 on St Giles High Street. This London branch is the third, with others in Japan and Causeway Bay, Hong Kong. 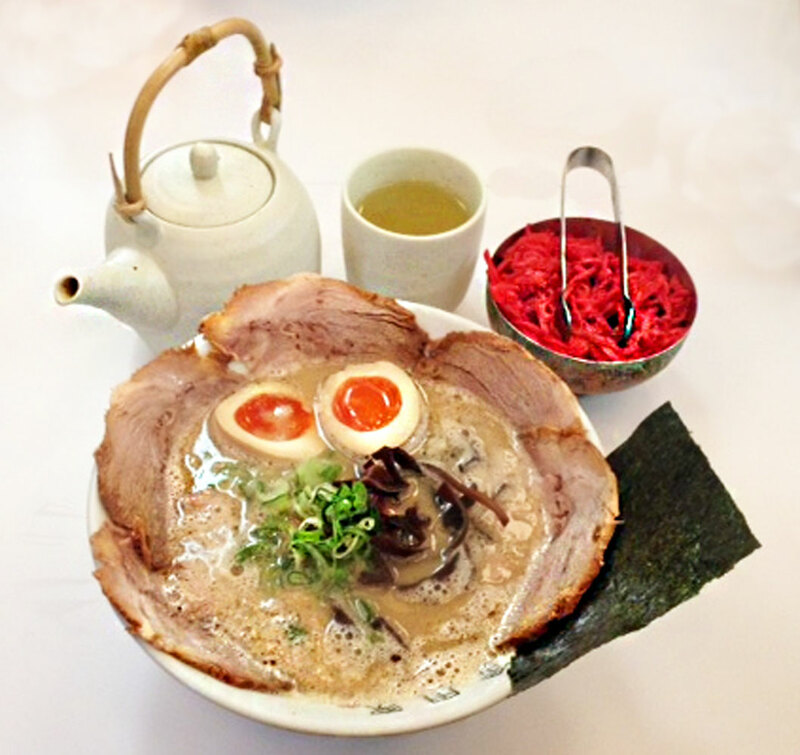 Kazuhiro Kanada is the owner and a former bike courier who taught himself to cook the most celebrated dish from his region, which is Hakata tonkotsu ramen, and it’s this pork-bone ramen that Kanada-ya has as its raison d’être. There are so many restaurants of every culinary hue in London that queueing is rare. If the restaurant is full one just goes next door. But I had noted that even on cold winter nights Kanada-Ya had a line of patient soon-to-be diners silhouetted against steamy windows. Such is the popularity of this bijou eatery that we turned up after its dinner opening time of 5pm to find only a couple of seats vacant. We had arrived at 5.05pm! There are two reasons for the queue. First is that it’s a very small restaurant. It offers 20 or so places for customers and considering that small number they seem to have a good complement of staff. I guess a quick turnover is the order of the day. Its décor is simple: pale wood, a mirror ceiling, vinyl table tops, an open kitchen and ambiance provided by the buzz of conversation in both English and Japanese. The second reason is that the food here is simple. It’s ramen noodles. Well, on the face of it it’s simple, but then one learns that the noodles are made here and bear no resemblance to those frilly articles, dry and with a ‘flavour’ sachet attached, found in your favourite supermarket. Kanada-Ya offers the real thing and one can even choose the texture of one’s noodles! It’s the broth in which the noodles are suspended which is truly the star. If you have tried noodles at other establishments then you would likely have enjoyed these with a light stock made with dashi. It’s delicious and full of savoury umami, but tonkotsu is far from vegetarian and it’s hearty – and labour-intensive to produce. Kanada-Ya’s menu revolves around that rich, creamy pork-bone broth that is tended for 18 hours every day. The bones are cleaned and the stock is continually skimmed to create a distinctive soup with a clean taste that is delicate rather than being over-porky. Yes, it’s still evidently a porcine product but it’s not fatty. The texture is perfect for coating noodles and also sipping as a soup. I would suggest that a ramen virgin order the original bowl of that 18-hour-tended broth with chashu marinated pork, wood-ear fungus, nori seaweed and spring onion. There are condiments on the table to add at will, but there are also extras on the menu. A must-try is Hanjuku egg (also called ni-tamago or ajitsuke tamago) which is a soft-boiled egg with the white perfectly cooked through, but with the yolk remaining slightly liquid and silky. The egg is marinated in a soy sauce. 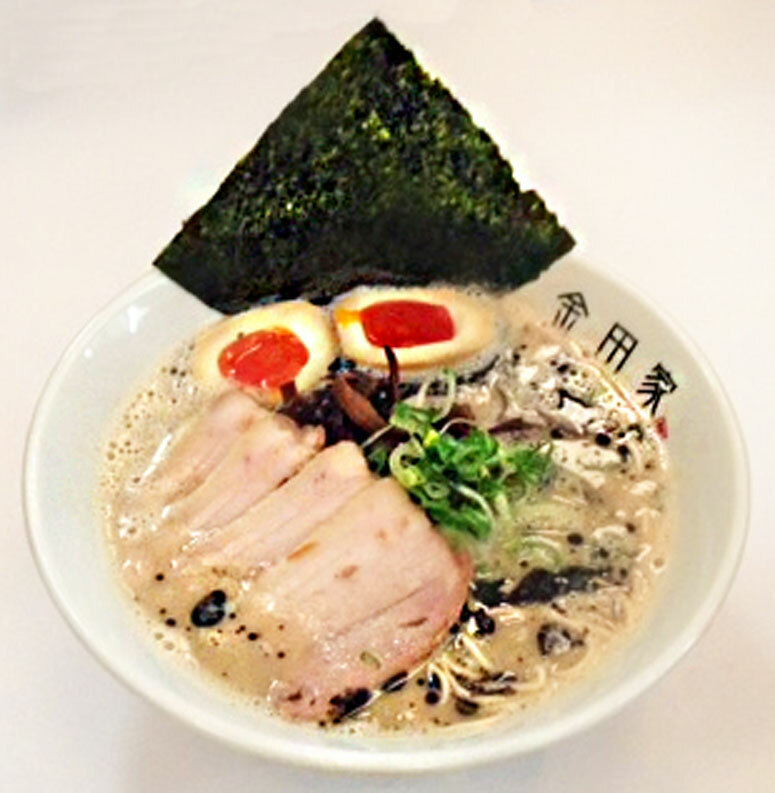 Other versions of ramen are on offer: Moyashi Ramen – a lighter version topped with blanched beansprouts, and Chashu-Men which is my favourite and which is garnished with Chashu pork collar. Charred black garlic sauce is an aromatic addition, and an extra sheet of nori always looks so beautiful. One can order extra noodles to add to any remaining soup. Kanada-Ya is popular for very good reason. The broth is outstanding, comforting and flavourful. Yes, it is honestly just a matter of taste but Kanada-Ya is very much to my taste.